Bangladesh Cricket Board (BCB) president AHM Mustafa Kamal met with numerous former national captains and incumbent Shakib Al Hasan yesterday to share views about improvement of cricket standard of the country. A few day labourers have set a rare example of devotion to education and the society in a remote village in Tangail at a time when many have turned education into a tool of making a fast buck. The labourers, mostly rubber garden workers and rickshaw-van pullers, set up a primary school at Aronkhola village from their daily savings three years back. A Danish footballer of Bangladesh origin named Jamal Bhuyan is likely to represent the national side after he was picked by the Bangladesh Football Federation in the 27-member preliminary squad for the World Cup pre-qualifiers on Friday. Pop guru and freedom fighter Azam Khan has been on life support at the city’s Square Hospital since yesterday morning. Pace spearhead Mashrafe Bin Mortaza will return home tonight from Australia with renewed hope to make a return to international cricket this year. Maintaining the quality of an entertaining variety show, that too for over two decades, is not a piece of cake. Hanif Sanket’s popular show “Ityadi” is a rare example of this feat. “Ityadi” has been a household name for Bangladeshis both at home and abroad. Sanket’s riveting persona and charismatic anchoring has made the programme hugely popular among its audience. Nobel laureate Muhammad Yunus has warned that Grameen Bank could run into deep trouble if the government amends the law to take control of the microfinance bank founded by him. Share market investors took to the streets in rowdy demonstrations again on Wednesday protesting at the free fall of share prices as the Dhaka stocks plunged by 151.74 points on the day. Ahammad Ali Gazi sighed as he surveyed his salt-covered land that once produced rice. 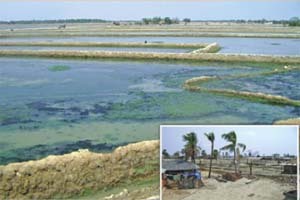 “This is the land where my family grew rice for years,” said Gazi, a 60-year-old farmer at Gabura in Satkhira district close to Bay of Bengal. “Today, there is nothing but salt. Nothing else grows here,” murmured Gazi, wiping sweat from his sun-burnt face. The farmer has only himself to blame. Students of private universities now running without permanent campuses are worried about what would happen if the universities do not take steps to move to permanent campuses as required by law. Transport operators at their whim continue to charge extra fares from passengers on all routes in the capital, apparently due to lack of government control over the sector. Nobel Laureate Professor Muhammad Yunus yesterday urged the 83 lakh members of Grameen Bank to remain vigilant against any attempts to take away the microfinance bank from the majority shareholders. The immediate-past chief justice, ABM Khairul Haque, who had ruled against the caretaker government system, said on Tuesday that time would say who would head the caretaker government during the next general elections. Microsoft chairman and co-chair of Bill and Milinda Gates Foundation William H (Bill) Gates has expressed keen interest to work together with Bangladesh to help it attain the millennium development goals.